Once again went to Portiragnes Plage in the South of France, this time the four sisters had managed to get together for a long weekend, hopefully the first of many. We ate at La Piloitte in the square, a lazy afternoon without a care in the world. Three of us decided to have the three goats cheese salad for starters, the amount was just right and not too filling. For main course I had steak au poivre this was beautifully cooked medium rare perfection on a plate. It was served with ratatouille a baked tomato and dauphinoise potatoes. I had to have a couple of glasses of vin rouge to wash it down, from the Languedoc of course. My dessert was ile flottante which I have had several times but never disappoints. Crumble was the order of the day for Pat and Bernie. Maureen just ate a pizza which she said was very good and tasty. This restaurant is very reasonably priced, the service is excellent and I shall definitely visit again when I return to Portiragne at the end of May. Well I set off with Gerard and Reuben for a few days in the South of France, unfortunately for jess she was supposed to be coming but couldn’t at the last minute. What a treat she missed, the weather was fabulous and it wasn’t very busy either so a good time to visit. Because there was only a few restaurants open we decide to eat at L’eau Christians we have eaten here before but thought we would try it again. The plate du jour (are you impressed) was a treat each day something different from beautiful lamb which melted in your mouth to roast breast of duck, or a bavette du beuf !! These were served with frites and salad or vegetables. 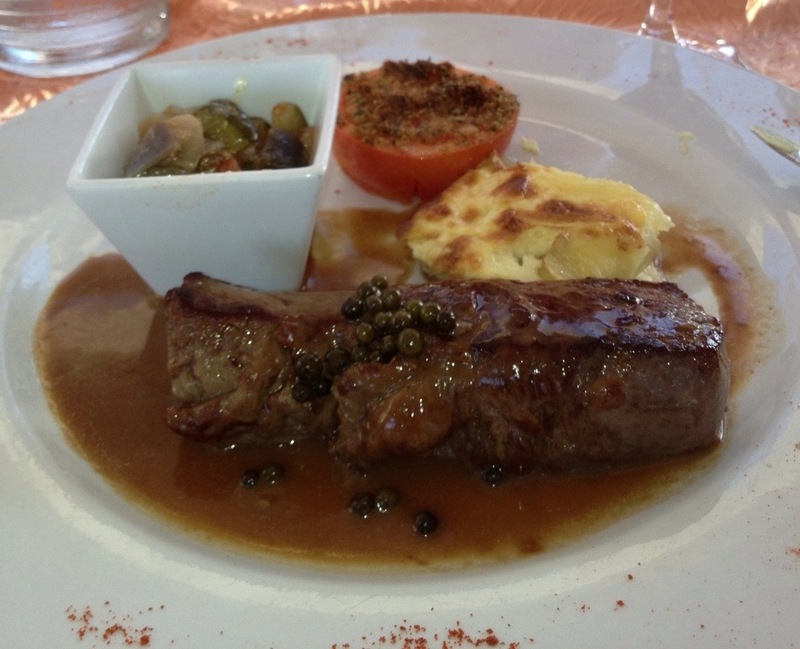 The meals were simple and exceptional value from 6-10 euros. It was washed down with Rose wine and occasionally followed by pom de tarte al la creme. Because the value and service was so good we decided to eat there for the four nights we were in Portiragne. I will be visiting again probably next April. Booked very last minute, I was fortunate enough to join Tess and Gerard on their pre- Easter break serching for properties in South East France….Flying from Luton to Beziers 6.35am we were in Portiragnes Plage enjoying a beer by noon….although my french is practically non-existant I soon picked up odd words and phrases, one of which was used regularly…la meme chose, same again…. The season does not really start until May but a few restaurant and bars were open for business, one of which was Le Caraibe, the owners are fab, for every 2 rounds we bought they insisted on buying us 1..it made us visit them on several occasions. We decided to try the Caraibe restaurant and although the service was slow the food which included Oysters and baked Camembert for shared starters followed by entrecote and lamb cutlets were very good..all washed down with a few glasses of champagne and beers…. Around the corner from Le Caraibe is Christians, again a good meal served with plenty of good chips and salad…Tess opted for pork, Gerard had duck as for me, steak which was well cooked….I really wanted roast chicken and chips from the rotisserie but all were reserved for clever people who knew to pre-order..damn! On our little excursions an we discovered several pretty villages, one of which was Magalas, in need of refreshment we found a locals cafe/restaurant, entering for a coffee we ended up having a meal which, as described by Tess was delightful…. hungry as usual, I had pizza which was very nice but Gerard won the day by having the 11 euro menu of the day…..envious, to say the least we watched Gerard devour the seafood quiche, followed by plate of couscous with all types of meats and then a creme brulee to finish……wow!! A very pleasant afternoon was spent visiting Gerard’s friends, Gill and Barry. Vieussan is a picture postcard village with beautiful views across the river Orb…simply stunning..Gill is a fabulous cook and a meal of homemade lasagna with garlic bread and fresh salad followed by a warm chocolate pastry in cream…sorry can’t remember the name was delicious. Gill and Barry are excellent hosts and very good company, I must say a big thankyou for making me feel so welcome…after lunch a walk to the river and a go on the rope swing for Tess and Gerard…pic’s to follow Remembering to pre-order the previously mentioned rotisserie chicken we ventured out to collect…having a few beers along the way we arrived 20 mins late to collect only to find that Christians were having their opening night….an explanation/apology in french was quickly given by the owner…chickens running late!!! and we were invited in for champagne and canapes….how could we refuse, in short we did’nt…3 glasses later and fairly full we thanked our hosts and collected our well cooked chicken and chips and staggered off home…chicken eaten and a few beers/wines later we had an early night for our trip home the following day…..many thanks dear friends for your hospitality and good company. Dawn. We were in Paris to visit Olivier and Christianne and the weekend started with a bang literally, as we approached passport control we were quickly ushered back as the rest of the terminal was empty. Due to an unclaimed bag the bomb squad had been called in and the bag was the the victim of a controlled explosion. Saturday night we walked from Olivier and Christianne’s apartment in the very cosmopolitan Daumansil(?) area along the regenerated derelict train line to the Bastille. June 21st is a festival of music every year in Paris with bands performing on every corner and in bars/restaurants. We decided we needed sustainance after walking 4 miles so we stopped for dinner at an old haunt(back in the day) of our guests called Le Square Trousseau, very old style bistro looked great……………….. the food was highly average so it must have gone down hill. We then just strolled around stopping for cocktails and listening to the most eclectic music ever. It semed like all of Paris was on the streets along with all the tourists. Our favourite bar was a Piano bar on a boat moored opposite Notre Dame on the Seine called O Fil De L’o. The quayside was just a melle of music and people having fun in the summer, Globe Troffers have to go! The wierdest bit was cycling, yes cycling back 5/6 miles at 1.45 am with people, cars and scooters everywhere. The Paris bike scheme is great, pick up a bike in one place and return it somewhere else, it’s cheap and clean(an adventure!!). Sunday was chilled out with long walk in the park followed by lunch (fillet of beef, bread, Camembert all purchased in small local shops) at home accompanied by an exceptional red of Oliviers, 98 Louis Latour. After a rest we got the Metro to Bastille and had dinner at Chez Paul(13 Rue de Charonne 75011 Pais). We all had late season white asparagus with a shared Foie Gras all superb. Christiane had a mixed fish casserole, D had steak and the boys had sardines all excellent. Deserts were a mixed small selection that didn’t really work but the cheese and port followed by cognac finished off a must visit establishment if you are looking for traditional French Farmhouse cuisine. Then guess what we cycled home which was interesting after Sancerre and Haute Medoc…………..
On Monday we decided to take it easy and went to see old Mona Lisa at the Louvre. Lunch was at a walk in Italian(Giambattista il sardo, 7 rue de chevalier st. george paris 8e)over by the Madeleine Cathedral and you know what sometimes you’re just lucky. I had a fantastic Tuna tartare as a starter and D had a Salade de Caprese both spot on. For mains we both decided on a seafood Spaghetti which was excellent. Then we flew back only for Jet 2 to lose D’s luggage. This restaurant was recommended by my brother, Gerrard. Me, Julia and Luke went out for our evening meal, Luke and I both had steak a point'(med rare) Julia had steak avec canard bien cuit (well done) served on skewers. Both meals were very tasty but the steak with duck was exceptional, washed down avec vin rouge et bierre. I shall visit again in August when I return to the South of France.